Just like any project that requires tools, measuring, fractions, or spatial relations, building this simple press was not easy for me. First I had to saw the wood. I didn’t want to have to go to Home Depot (ick) to get someone to do it for me I had a piece of fake oak shelving I’d bought but hadn’t used. So I used my funky little hand saw (that I bought when I became a home owner and thought I should have a basic set of tools in a toolbox “just in case”) to cut the shelf in half into two one0-foot square pieces. It took forever and my cut was wobbly, uneven and made a mess of the veneer. Then I measured in from each corner one inch and drilled holes, guessing how big they should be. Unfortunately, since my cut wasn’t even, the holes didn’t line up right and they were too small. So when I assembled all the pieces the boards were all tilty and got stuck. I finally got it all apart again and redrilled the holes larger. This solved the problem and the press worked fine. Like every step in the bookbinding process, I learned something valuable along the way. In this case I learned I should have clamped the two boards together and just drilled right through both of them to make the holes line up. In my next post I’ll offer some resources for do-it-yourself bookbinding including the tips I learned from my mistakes. Looks like you’ve had a good start to the new year. I look forward to seeing your sketchbook – I love the pomegranite in the tea cup. Gosh, I have one of those! But yours is better because it has a handle in the middle. Mind if I copy that idea and put a handle on mine? Can’t wait to see your book…..
You know, I wonder if your contraption would help with my lino block printing? I have some leftover shelving that I could put screws into… And thanks for the tip about just drilling through both blocks as I probably would have done them seperately also-doh! Very nice! I have never really wanted to make my own journals, but since I’ve got eleven started, and none finished –because there is always something I hate about them– I just might have to start doing so! 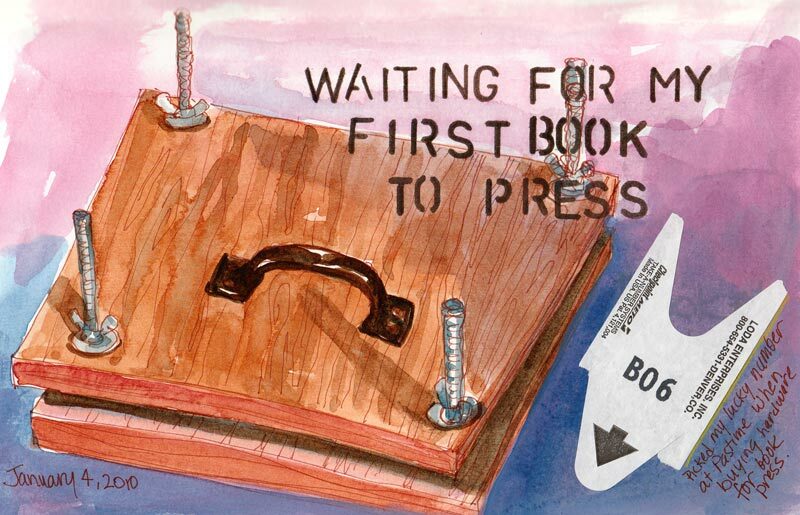 The book press looks easier enough to do…now about the rest! Love your sketch here, and the pomegranate! You are a brave soul, Jana. Learning by doing, going bravely where you have never gone before. I really am looking forward to seeing your new journal. I have an old one but I’m impressed at your work ethic- that you are making your own. Fabulous sketch. I’ve just purchased a Bind-it-all machine to make my own spiral bound journals. I shall watch your progress with interest. Bravo to you forthe entire project and no emergency run to the hospital!!! I will look forward to all your hints on this project. LOVE the painting. Terrified of bookmaking. I thought it was like sewing, but you are making it look rather manly right now. I like that. First, many thanks for all your great instructions on binding the book – and the links to both of the You Tube instructions – I think they give all you need, especially Sage Reynolds who shows you everything you need to know. I found it a real help that you shared where things went wrong – more than anything else I guess. Just one thing – why does the book press have springs? Jana your book press is exactly like mine only I got my ex to build it for me because it would have been impossible from a wheelchair but we must have used the same plans. *LOL* I love it though even though mine doesn’t look perfect it works very well. Love your blog!